The Bank of Japan unanimously voted to maintain its policy to increaseJapan’s monetary base by ¥60-70 trillion annually and to keep its total target at ¥270 trillion at today’s meeting. The statement accompanying the announcement noted that “exports have recently leveled off more or less,” which is in contrast to the upbeat tone noted in February. This comes after Japan recently posted a record current account deficitas exports plummeted. January’s disappointing fourth-quarter GDP figures and the loomingsales tax increasenext month also raised concerns of a slowing Japanese recovery. While no policy changes were expected, markets were watching closely for a possible change in the BOJ’s economic assessment. Despite recently soft economic data, the policy board affirmed its positive outlook for the Japanese economy and pledged to continue easing until the nation reaches a stable 2 percent inflation. 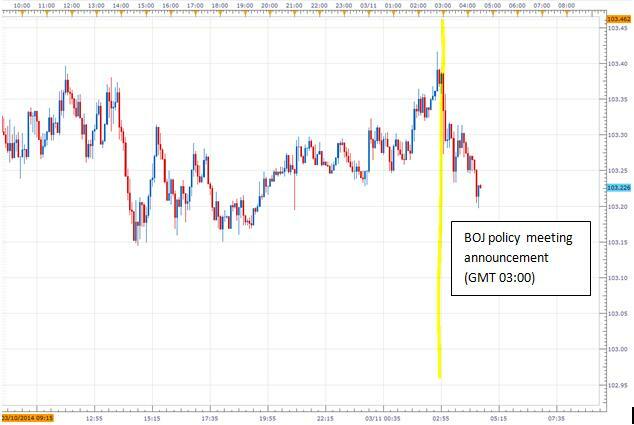 Inflation, measured in terms of CPI growth, is projected to remain around 1.25 percent “for some time.” The Japanese Yen saw only a brief and muted rally immediately after the news as the announcement was mostly in line with markets expectations. The BOJ launched their aggressive asset purchases and expansion of monetary base in April of 2013 in an attempt to end 15 years of deflation in Japan and target a 2 percent inflation rate. The monetary easing policies were a part of the newly elected Prime Minister Shinzo Abe’s “Three-Arrows” agenda to revive the economy. Want to trade with proprietary strategies developed by FXCM? Find out how here.